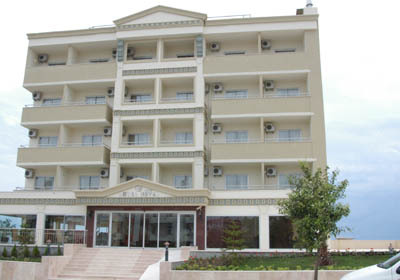 Situtated in Side, just 1 km from the historical centre of Side. Antalya airport is just 65 km away. Reception * lobby * indoor and open-air restaurant * 3 bars * pattiserie * outdoor and indoor swimming pools * pool with slide * 2 meeting halls * disco. 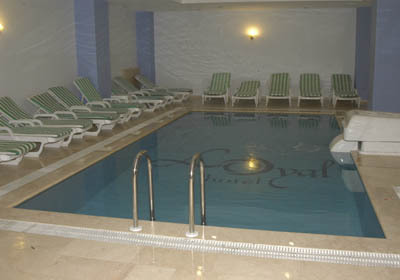 Turkish bath * sauna * fitness * table tennis. 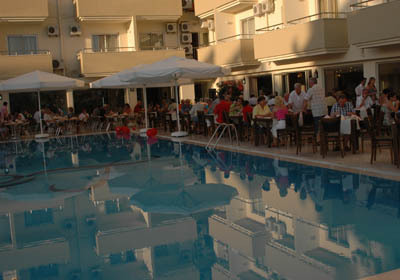 Fresh fruit juices, massage, drinks in beach bar, drinks in the a la carte restaurant, internet café, billiards. Air-conditioning (central) * balcony * minibar (drinks payable locally) * satellite TV * bathroom with hairdryer * telephone * safety box (payable locally). The private sandy beach is just 150m away. Sunbeds and umbrellas available free of charge. 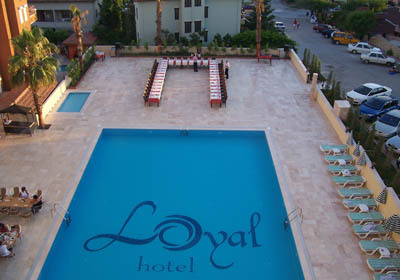 Unlimited soft and alcoholic local drinks between 10.00-23.00, in disco between 23.00- 24.00.